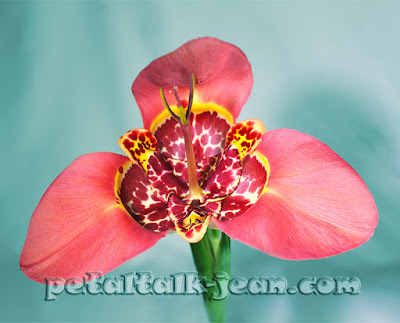 Somewhat like an Iris, a family to which it belongs, Tigridia, or shell flower, is in a class of its own. The center of the flower is a cup of many colors, with three "handles," or petals, floppy yet firm, like a puppy's ears and about the same size. Flower colors range from white to deep pink, pale to bright yellow and orange. I bought a mix in 2016 and potted them up with a Pelargonium, and when they emerged some time in August, I was immediately impressed with their weird beauty. They have a somewhat messy demeanor, though, and when they finished blooming, I dragged the huge pot under the eaves to a north-facing spot right up next to the garage. The pot stayed there all winter. Imagine my surprise when this decidedly non-hardy bulb sprouted this spring. I had other plans for the pot, so I dumped out all of the bulbs and tucked them into the VegTrug, where I'd planned to grow flowers for cutting, and into a smaller pot with some Eucomis. I can only guess that it was our mild winter that saved these tender little bulbs. That, and the fact that they were kept dry and were in a pot with thick walls. When they began to bloom in July, I saw that most of the flowers were a pale yellow. Some grew near another pot containing Cosmos atrosanguineus, or Cosmos 'Chocamocha', which has flowers that smell like chocolate. I like the way they looked together, and found that the Cosmos, once it get's going, is really feisty and insinuates itself into and over anything growing nearby. 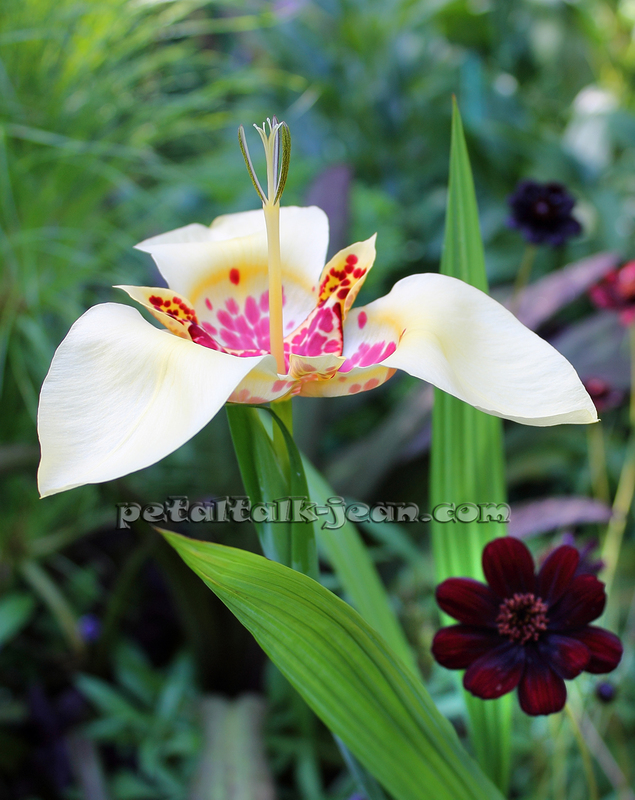 I decided that, if I were to mix Tigridia in a container with anything, it could be with 'Chocamocha', which would disguise the Tigridia's less-than-pretty demeanor between blooms. When they first start to open, Tigridia flowers look like tulips. It all happens in a day, so you have to pay attention. That's the problem with Tigridia--each flower lasts only a day. After the flower is finished, it shrinks down into a soggy bud that's favored by Japanese beetles. It's not pretty. The bottom line on Tigridia? For me, I'm happy to have made their acquaintance. But I don't think I'll be keeping them in my repertoire. If I had lots of space in the ground with full sun, I'd grow them along with Gladiolus. The bulbs are rather inexpensive. I purchased ten bulbs for under $10. 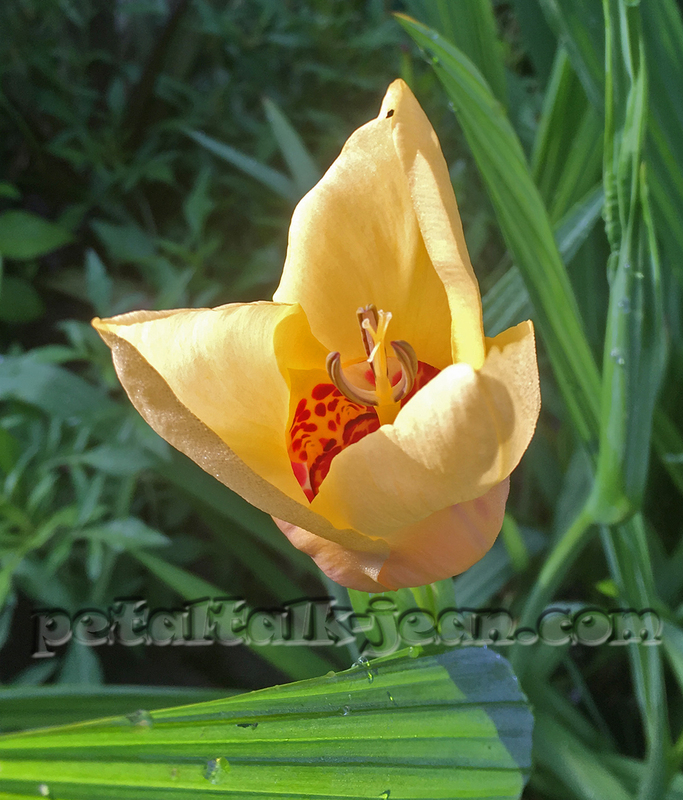 Easy to Grow Bulbs has them in single-color packages, a good thing if you prefer one of the colors. 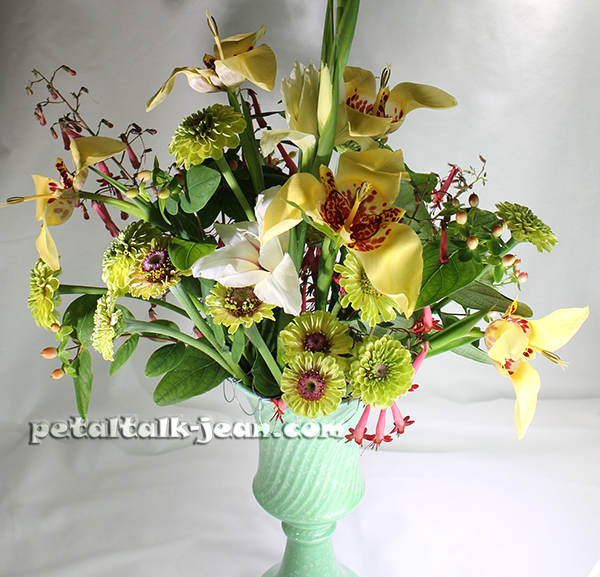 Tigridia in a vase only works if you are prepared to remove the flowers once they're finished blooming a day later. What a lovely bouquet. A nice flower too. I usually don't purchase flowers I have to deadhead. All my daylilies taught me that lesson.